The Ticket Lottery Presale will begin at 9 a.m. (CST) on Monday, April 1, 2019. The presale will run until Sunday, April 7 at 11:59 p.m.
First, please review all the information below to see if your question is answered here! If you still have questions or concerns about your ticket order please contact us as soon as possible. All help-requests are time-stamped. We will respond to your question as soon as possible. Regardless of your method, be sure to provide your full name, phone number, email address, order number (if applicable) and a description of your issue. Contact us via direct message to the American Girl Benefit Sale Facebook page. The Ticket Lottery Presale offers motivated shoppers the chance to get the earliest possible entry times for the Saturday Sale—and the ability to purchase Early-Entry Sunday times. Tickets are purchased online and every shopper who places a ticket order on the same day has an equal chance of getting the earliest entry times available that day. Tickets go on sale in early spring. The General Sale offers shoppers the chance to select a specific entry time for Saturday tickets. Ticket times will be after those distributed during the Ticket Lottery Presale. The general ticket sale is held in the spring, about two weeks after the Ticket Lottery Presale. Sunday Markdown Sale Early-Entry: $20 per person for entry between 7 and 9 a.m.
Sunday Markdown Sale General: FREE tickets will be distributed on-site, starting at 7 a.m. for entry after 9 a.m.
All persons entering the sale, including children, must have a ticket. Children under three are not permitted in the sale warehouse, due to safety concerns. We reserve the right to revoke or refuse to honor tickets that have been resold for more than the face value of the ticket. Tickets held at will call will only be released to the attendee who purchased the ticket, with ID. We will only honor one ticket per attendee. We will permit shoppers to buy a second set of tickets during the General Ticket Sale to reenter the warehouse. Reentry times will be restricted to later in the day. How do I buy tickets to the American Girl Benefit Sale? How does the Ticket Lottery Presale work? How does the General Ticket Sale work? What is the difference between the Ticket Lottery Presale and the General Ticket Sale? If I place my order during the Ticket Lottery Presale am I guaranteed a ticket? What is the difference between the Ticket Lottery Presale and the mail-order ticketing procedure from previous years? How do I get to the web ordering form to purchase tickets? Can I purchase tickets online using a smartphone or other mobile internet-enabled device? What if I am unable to place my ticket order online? How many tickets may I purchase? What forms of payment are accepted for ticket orders? Why is there a 50-cent per-ticket processing fee? Why do I have to pay sales tax for my ticket? What can I do to ensure I receive an early entry time on my tickets? Is the new ticketing system still fair, with respect to the distribution of entry times? If I buy my tickets during the Ticket Lottery Presale, how and when will I know what entry time I received? If I place an order for multiple tickets, will everyone in my group receive the same entry time? What if I cannot attend the sale at the entry time printed on my ticket or I do not like the entry time I was assigned? Can I purchase tickets online using a smart phone or other mobile internet-enabled device? Tickets may be ordered online and paid for with a credit card, using our online ticket ordering form. We can not accept any mail-ordered ticket requests. The Ticket Lottery Presale will start at 9 a.m. CST on April 1, 2019 and will end at 11:59 p.m. CST on April 7, 2019, or when all tickets have been sold. In previous years, there have been tickets still available after the Ticket Lottery Presale. The General Ticket Sale will start at 9 a.m. CST on April 15, 2019, and will remain open until all tickets are sold. The Ticket Lottery Presale will begin on April 1, 2019 at 9 a.m. CST and end on April 7, 2019 at 11:59 p.m. CST, or when all tickets have been sold. In previous years, there have been tickets still available after the Ticket Lottery Presale. During the Ticket Lottery Presale, you may place an order for a set number of tickets for an unknown entry time starting at 7 a.m. CST for the Saturday Sale, and starting at 7 a.m. CST for the Early-Entry portion of the Sunday Markdown Sale. Just like in previous years, ticket entry times will be allocated by lottery, based on the day that each ticket order was placed. Entry times in the Ticket Lottery Presale will be allocated from earliest to latest entry time, and no tickets will be held back. Orders placed on the first day of the presale will be eligible for the earliest ticket times; orders placed on the second day will be eligible for the next-earliest ticket times after all orders from day one are fulfilled, and so forth. For the purpose of the sale, a “day” is defined as the time between 12 a.m. CST and 11:59 p.m. CST on a single calendar date. For example, this means that all orders placed on April 1, 2019 will be randomly allocated tickets for entry times starting at 7 a.m. CST for Saturday Sale ticket orders and 7 a.m. CST for the early entry portion (7-9 a.m.) of the Sunday Markdown Sale ticket orders. Once all of the orders placed on April 1 have been allocated tickets, orders placed on April 2 will be randomly allocated tickets for the earliest entry times still remaining after the fulfillment of the previous day’s orders. As in previous years, the entry times available on each day and the odds of securing a particular time will depend on the volume of orders placed. Please note that ticket times are randomly assigned based on the date the ticket order was placed, without reference to the time of day. For example, there is no need to place your order exactly at 9 a.m. on April 1 to be included in the first allocation group for the Ticket Lottery Presale; you only have to place your order before 11:59 p.m. CST on any given date to be included in that day’s ticket lottery. This is the same ticket allocation system that was used in previous years for mail-order tickets, to ensure all ticket buyers have a fair and equal shot at early entry times. In past years, when tickets were ordered by mail, orders were entered in the lottery based on the postmark date, regardless of the time of day that the ticket order form was mailed. The online ordering system continues the tradition of grouping orders by the date the order was placed, regardless of the time of day. All tickets purchased during the Ticket Lottery Presale will be mailed directly to the purchaser; there is no need to provide a self-addressed, stamped envelope. The General Ticket Sale will start at 9 a.m. on April 15, 2019, one week after the completion of the Ticket Lottery Presale. During the General Ticket Sale, you may purchase tickets online for specific entry times. For example, a buyer may choose to purchase four tickets for a 1:15 p.m. entry time. The General Ticket Sale will include all tickets not sold during the Ticket Lottery Presale. As in previous years, the entry times and number of tickets available for the General Ticket Sale will depend on how many tickets were sold during the Ticket Lottery Presale. No ticket inventory will be held back, and the earliest ticket time available for the General Ticket Sale will not be announced until the General Ticket Sale starts on April 15, 2019. All tickets purchased during the General Ticket Sale on or before Sunday, June 9, 2019 will be mailed directly to the purchaser; there is no need to provide a self-addressed, stamped envelope. Orders placed on or after June 10, 2019 will be held for pickup at will call, on-site at the sale. In the Lottery Presale, buyers will not be able to select their specific entry times, and in the General Ticket Sale, they will be able to select and purchase specific entry times. The Lottery Presale will include all available tickets starting at the earliest available entry time (7 a.m. CST) and the General Ticket Sale will include any tickets not sold during the Ticket Lottery Presale. It is very likely that the General Ticket Sale will only include entry times for later in the day, and not the early morning. As in all previous years, we cannot guarantee the availability of any particular entry time, as availability depends on the volume of ticket orders received during the Ticket Lottery Presale. Every purchaser who places an order for Saturday tickets during the Ticket Lottery Presale will receive the number of tickets they have paid for, but no specific entry time is guaranteed. Every purchaser who places an order for Early-Entry Sunday tickets during the Ticket Lottery Presale will be placed into a lottery for all available tickets; tickets for Early-Entry Sunday are not guaranteed. If there are not sufficient Early-Entry Sunday tickets for all purchasers, those not randomly selected during the lottery will be issued refunds. All Early-Entry Sunday ticket purchasers will be notified of their status on April 15, 2019. If you are selected to receive an Early-Entry ticket you will be informed about your ticket time on April 15. If you were not selected to receive an Early-Entry ticket you will be notified about your refund on April 15. What is the difference between the online Ticket Lottery Presale and the mail-order ticketing procedure from previous years? Ticket orders submitted during the Ticket Lottery Presale will be placed online. We will not accept any ticket requests by postal mail, nor any mail-ordered ticket forms, and there is no need to send a self-addressed, stamped envelope. Other than the transition from mail-order to online purchasing, the ticket allocation procedure has not changed. The Ticket Lottery Presale utilizes the same ticket allocation system used in previous years for mail-order tickets, to ensure all ticket buyers have a fair and equal shot at early entry times. In past years, orders have been entered in the lottery based on the postmark date, regardless of the time of day that the ticket order form was mailed. The new ordering system continues the tradition of grouping orders by the date the online order was placed, regardless of the time of day. 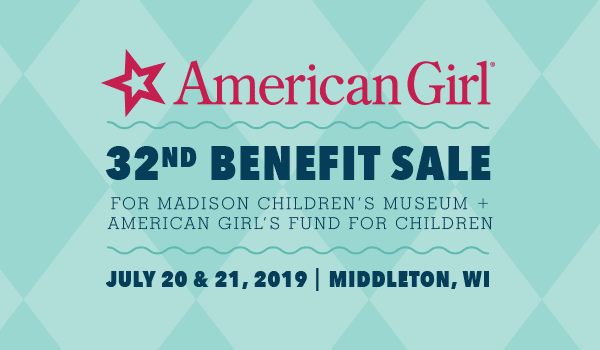 If you are a member of the American Girl Benefit Sale email list, you will be emailed a link to the ticket ordering page two days before each ticket sale. This means you will receive a link to the Ticket Lottery Presale order form on March 30, 2019, and you will receive a link to the General Ticket Sale order form on April 13, 2019. On April 1 and April 15, links will also be posted to Madison Children’s Museum’s Facebook page, Twitter account, and Instagram page. On the museum’s website, the American Girl Benefit Sale information page and this F.A.Q. will also be updated with links to the web order form. If you are not signed up for the benefit sale email list, or if you are uncertain of your status, please use the enrollment form on our website to sign up and ensure you are included on all benefit sale announcements and notifications. Yes, our web forms are mobile-friendly, and will be accessible from the internet browser of any internet-enabled device. If you plan to place your order from a mobile device, we advise you to make sure you have access to a wi-fi connection or a very reliable mobile data connection before placing your order, to ensure that your order is not interrupted by a poor connection. If you choose to purchase your tickets over a mobile data connection, standard data rates may apply, per your mobile data service agreement. Please note that some users may find it is easier to use a laptop or desktop computer, as you will be typing in your email address, shipping address, and other contact information, which may be more difficult or time-consuming from a mobile touch screen. We strongly recommend that all buyers place their ticket orders online. The new online ticketing system has been designed to offer the fastest and most user-friendly ticket-buying experience possible, and is intended to be used by all purchasers who are not experiencing technical difficulties or other extenuating circumstances. However, we do understand that some users may encounter technical or practical obstacles that prevent them from completing an online order. For buyers experiencing extenuating circumstances that prevent them from completing an online order, we will offer phone support for telephone order placement on weekdays (Monday-Friday) during the Ticket Lottery Presale and the General Ticket Sale. Please see the bulleted schedule below for more information on when phone support will be available. We will also offer in-person sales at Madison Children’s Museum during the museum’s regular operating hours. Please see the bulleted schedule below for more information on when tickets may be purchased in-person at the museum. During the General Ticket Sale, phone support will be available on weekdays (Monday-Friday), from 9:30 a.m. to 5 p.m. CST during Madison Children’s Museum’s regular operating hours. During the General Ticket Sale, phone support will not be available outside of regular business hours. During the Ticket Lottery Presale and the General Ticket Sale, tickets may be purchased in-person at Madison Children’s Museum between the hours of 9:30 a.m. and 5 p.m. CST on days when the museum is open to the public only. In-person sales will not be available outside of regular business hours. Please be advised that buyers calling to purchase by phone or visiting the museum to buy in person may experience long lines, hold times, and delays, depending on the volume of calls and visits we are receiving. We ask that all buyers who are able to place their orders online do so, to keep the lines free for those experiencing extenuating circumstances. Purchasing by phone or in-person will not make the buyer more or less likely to receive an early entry time. We thank you for your consideration and understanding in this matter. Your tickets will be mailed to you directly via the US Postal Service. There is no need to provide a self-addressed, stamped envelope. We will begin mailing out tickets starting at the end of April 2019, and will continue to mail tickets through mid-June 2019. All tickets ordered on or before June 9, 2019 will be mailed directly to the purchaser. To ensure that delivery delays do not interfere with your ability to attend the sale, tickets purchased on or after June 10, 2019 will not be mailed, and will instead be held for pickup at will call on-site at the sale. Will call will open for pickup at 6 a.m. CST on Saturday, July 20, 2019 and at 6 a.m. CST on Sunday, July 21, 2019. If you place your order on or before June 9, 2019, you should expect to receive your tickets by July 15, 2019. If you do not receive your tickets by this date, please contact us, and we will address the issue for you. Early-Entry Sunday Markdown Sale tickets: $20 per ticket for entry times between 7 and 9 a.m. CST; free tickets for entry times after 9 a.m. will be distributed on-site, starting at 7 a.m. on Sunday, July 21, 2019. Sales tax and a 50 cent per-ticket processing fee will be applied to all advance ticket sales; there will be no taxes or fees assessed for free tickets distributed on-site at the sale. You may purchase up to six tickets for the Saturday sale, and two for the Early-Entry Sunday Markdown sale. What forms of payment are accepted for ticket purchases? For orders placed online, we accept payment by Visa, MasterCard, Discover, and American Express. In the event that you are unable to place your order online and have to place your order by phone, we will accept payment by Visa, MasterCard, Discover, and American Express. In the event that you are unable to place your order online and choose to place your order in person at Madison Children’s Museum, we will accept payment by cash, check, Visa, MasterCard, Discover, and American Express. Why is there a 50 cent per-ticket processing fee? In previous years, we have required everyone who bought tickets by mail-order to send a self-addressed, stamped envelope, which we would return by mail with the ordered tickets. Because tickets were mailed in pre-stamped envelopes, Madison Children’s Museum did not incur any shipping costs on tickets. In the earlier years of the benefit sale, before we began accepting ticket orders online, we primarily accepted check payment for tickets, and did not accept credit card payments for the Ticket Lottery Presale. Because the majority of ticket payments were made by check, Madison Children’s Museum did not incur significant processing fees on payment for tickets. With online ticket sales now available, purchasers do not have to mail a check for their order, and they do not have to send an extra stamped envelope for their tickets. The addition of a small per-ticket processing fee helps us defray the cost of accepting credit card transactions and covering postage and envelopes for mailing out the tickets; previously, we did not incur this cost for the reasons explained above, and asking the purchaser to continue to cover the cost of shipping and processing helps us make sure that all revenue generated by the sale goes toward our mission of serving children through Madison Children’s Museum and American Girl’s Fund for Children. Madison Children’s Museum has always paid sales tax on the value of American Girl Benefit Sale tickets sold to attendees, but prior to the 2018 benefit sale, the sales tax was included in the $8 or $20 price of the ticket, and the museum paid state sales tax out of the ticket revenues collected. This means that in previous years, for every ticket sold, we were only able to apply part of the ticket revenue toward our mission of serving the children and families of Madison and Dane County, and part of the revenue was paid to the state as sales tax. Starting from 2018, we have asked attendees to cover the sales tax portion of their ticket purchases so that the full ticket price can be applied toward the joyful work of serving children and families. We believe that this change is in line with the charitable purpose of the American Girl Benefit Sale and the mission of Madison Children Museum and the American Girl Fund for Children. We deeply appreciate your support, which makes the work we do possible. Wisconsin has a state sales tax rate of 5.5%, so buyers should expect to pay approximately $0.44 in tax on a Saturday Sale ticket and $1.10 in tax on an Early-Entry Sunday Markdown Sale ticket. As in previous years, we cannot guarantee the availability of any particular entry time slot. The earliest ticket times on Saturday and Early-Entry between 7 and 9 a.m. on Sunday will be allocated to orders placed on day one of the Lottery Presale (April 1, 2019). The only way to be eligible for the earliest entry times is to place your order before 11:59 p.m. CST on April 1, 2019. All orders placed on the same day will be processed together, so there is no advantage to placing your order early in the morning versus late at night. If you purchase your ticket times during the General Ticket Sale, you will have the option to select the earliest available time, but please keep in mind that the early morning entry times are very likely to be fully allocated during the Lottery Presale. Is the new ticketing system still fair? The new online ticketing system for the Ticket Lottery Presale preserves the same lottery-based ticket distribution procedure as the old mail-order system, so it is exactly as fair as the ticket ordering system we have used in previous years. During the Ticket Lottery Presale, orders that are placed on the same day all have the same chance at the earliest remaining entry times, and entry times are assigned randomly, based on the day the ticket order was placed. Orders placed on the first day of the Ticket Lottery Presale will have a shot at earlier entry times than orders placed on the second day, and so on. As in previous years, we cannot guarantee what times will be available on any particular day of the Ticket Lottery Presale, as this depends on the volume of orders placed on the previous days. If I buy my tickets in the Lottery Presale, how and when will I know what ticket time I received? If you purchase your tickets during the Ticket Lottery Presale, you will receive an email on April 15, 2019, informing you of your assigned ticket times, and verifying your shipping address for the delivery of your tickets. If you purchase your tickets during the General Ticket Sale, you will be able to select your entry time when placing your order. Yes, all tickets purchased on the same order will receive the same entry time. Groups will not be split up into different entry times if their tickets are purchased together on the same order. If you are unable to attend the sale at the time printed on your ticket, but you are able to attend later in the day, please be aware that you can always enter the sale at any time after your scheduled entry time has been admitted into the warehouse. Your ticket will be honored at the door as long as the time on your ticket is not later than the entry group currently being admitted into the warehouse. The last entry time for the Saturday Sale is 2:45 p.m. CST and the last entry time for the Sunday Sale is 1 p.m. CST; no attendees will be admitted after these times. If you choose to attend the sale after the time printed on your ticket, please keep in mind that if we are experiencing delays admitting entry time groups into the warehouse due to crowding, your entry group may enter the warehouse slightly later than the time printed on your ticket. At no time will attendees be allowed to enter the warehouse before the rest of their entry group has been admitted, even if the entry time printed on their ticket has passed.For example, if the entry time printed on your ticket is 1 p.m., but we are still admitting the 12:45 p.m. entry group at 1:15 p.m., you will have to wait until the rest of your 1 p.m. entry group is admitted even though it is after 1 p.m. You will not be allowed to enter the warehouse with the 12:45 p.m. entry group. If you are unable to attend the sale either at or after the time printed on your ticket, you may choose to transfer your ticket to another attendee at no charge, or to sell your ticket for no more than its face value, printed on the ticket. If you choose to transfer or sell your ticket to another attendee, please keep in mind that Madison Children’s Museum reserves the right to revoke or refuse to honor any tickets that have been resold for more than their face value. If you are unhappy with your assigned entry time, please keep in mind that each American Girl Benefit Sale features a large variety and quantity of American Girl merchandise – including dolls, accessories, furniture, clothes, and more – and sale attendees have a wide selection of rare and steeply discounted merchandise to choose from all day on Saturday and Sunday. We understand that many attendees highly value early morning tickets, and may be disappointed if they receive late morning or early afternoon tickets, but even if you receive an entry time that is later than you expected, we strongly encourage you to attend the sale at the time printed on your ticket. As demonstrated by the quantity of inventory still available every year at the Sunday Markdown Sale, there is never a shortage of treasures to be found at the sale all day on Saturday and Sunday. Tickets to the American Girl Benefit Sale tickets are non-refundable.